We work hard to create a menu that is interesting, constantly evolving & a little out of the ordinary. Much of our meat & weekly specials are sourced from Sillfield & Gamston Farms @ Borough Market. 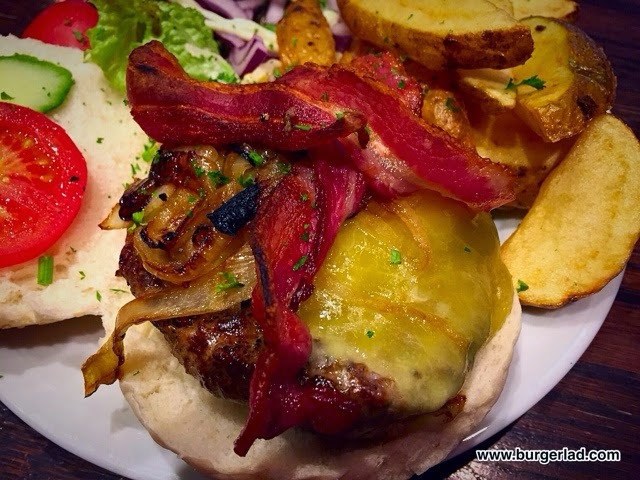 We also create our own Burgers, which are more than a little renowned… The Shergar 8oz Horse Burger (From Boro’Mkt) + cheese, onions & bacon. Lord Nelson was a fellow seafaring chap who enjoys enduring fame, due to several (and one particularly grand, in fairness) victories. He was also not encumbered by the Official Secrets Act. 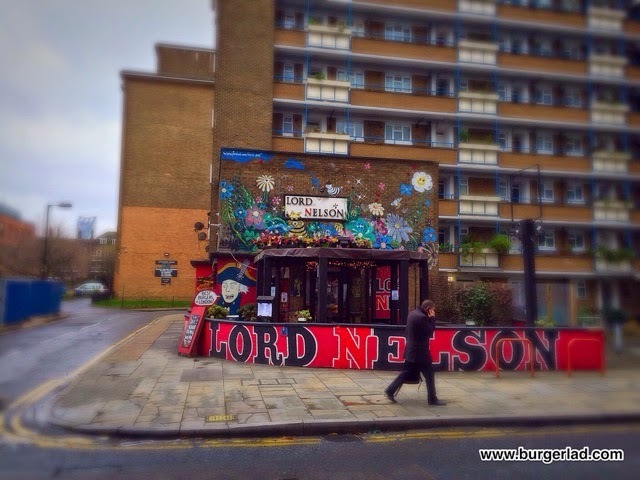 The Lord Nelson pub in Southwark does burgers, quite a lot of them. 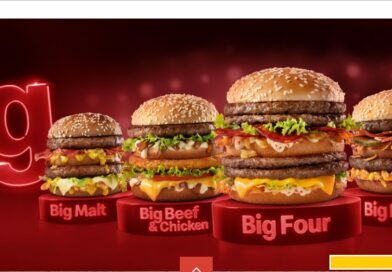 But they seem to be most well known for having introduced horse meat at the height of the fuss surrounding horse meat in supermarkets in early 2013, and their version of a U.S. Classic – the Juicy Lucy. What’s the place called again…? I can’t have both. You’ll see why in a minute. So I opted for the horse burger because it’s the more different of the two and I’ve had a sort of Juicy Lucy before, at Reds True BBQ. It’s very near Southwark station, stuck on the end of a plain block of flats. The pub itself is anything but plain, being decorated with lots of colourful bric-a-brac and having the name displayed prominently. Inside is an eclectic mish-mash of decoration. Lovely and warm, weird and welcoming. Dusting in this place must be a nightmare! I put my order in just before a huge stream of people came in. 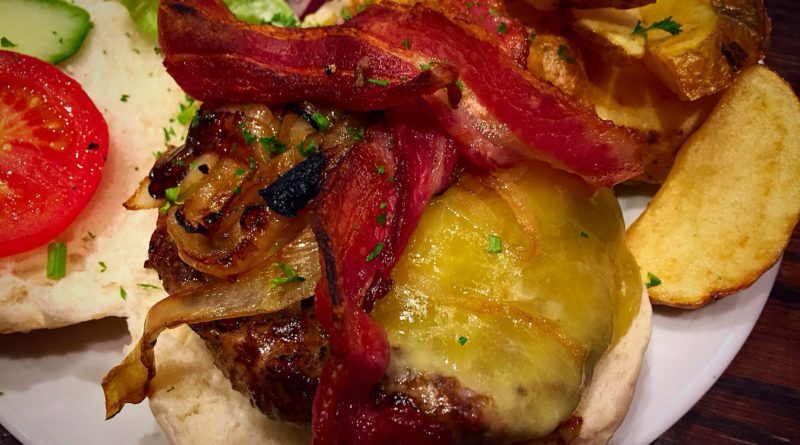 The horse burger (named Shergar – look it up if you’re under 40) comes with cheese, onion and bacon. 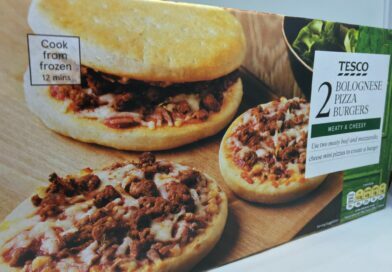 A limited amount of toppings, but the best ones, presumably to let the unique meat flavour come through. On the table, this was very typical pub stuff. Salt, pepper, vinegar, A4 paper menus and a big squirty bottle of ketchup. I waited for my food, hoping it had made it to the grill before the two large groups of men. I think it had, for I was not waiting long. A substantial plate arrived at my table. And when I say substantial, I bloody well mean it! This was quite possibly the biggest burger serving I’d ever had. Absolutely enormous chips. They were practically whole potatoes each. Massive collection of salad-cucumbers, red onion, tomato, lettuce, coleslaw. 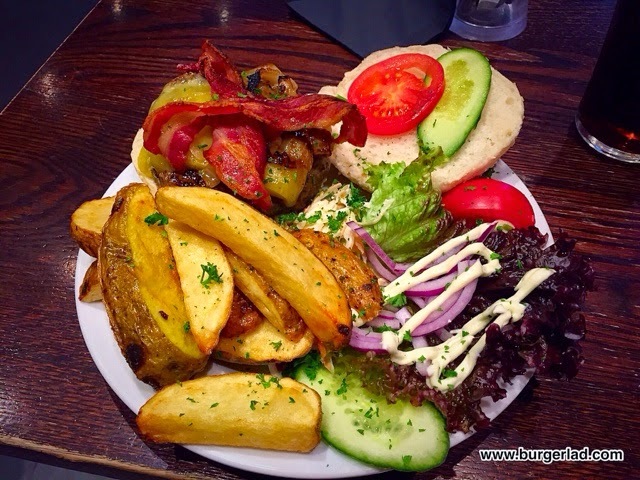 All of this could barely fit on the plate and the burger itself was hardly tiny either. A pale seeded bun with a large diameter had been selected to hold this in. Served at the outset with the top off. Two rashers of crispy bacon across the top, cheese that was about half a centimetre thick in some parts and loads of fried onions. And the meat. A huge thick patty in there. And it was (unsurprisingly) the taste of the meat that came through strongest, despite all these other ingredients in there. I can guarantee that you’ve never tasted anything like this. Not even venison comes close. The horse meat has a very distinct savouriness that, even if you didn’t know what it was, you certainly wouldn’t mistake it for something you did know. Unlike some exotic meats, this most certainly did not taste like chicken. 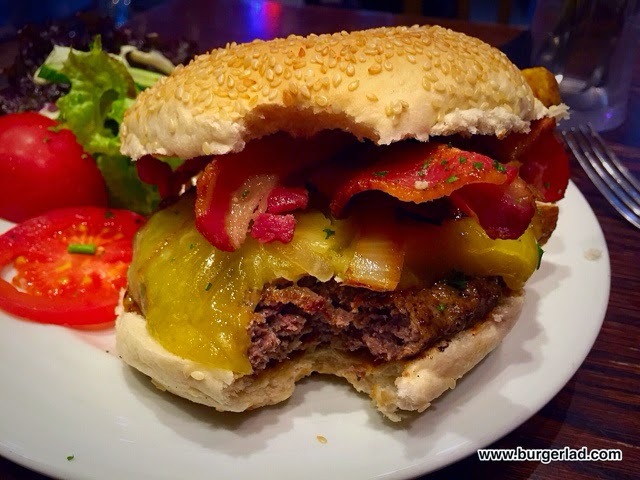 On the occasions that I got a bite without the horse, the cheese was strong – a great bite to it, and the crunchy bacon worked well with it to give a bit of reassurance that, despite the different meat, this was still a bacon cheeseburger. Returning to the meat, I must say that while I’m really glad I tried it, I’m not sure it can replace any of the more conformative meats on my list of favourites. 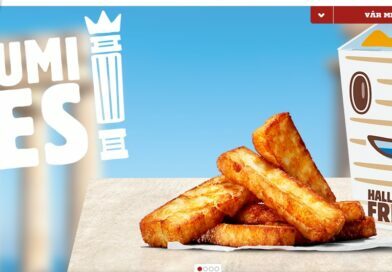 I don’t know if there’s a psychological element in there – are we involuntarily programmed to dislike food that’s a bit different, and have to overcome that? I don’t know. I didn’t dislike it though. I liked it. The main problem I had with it was that it just wasn’t good enough to make me feel happy that I didn’t have a Juicy Lucy. If I lived anywhere near here, I’d be in here a lot. 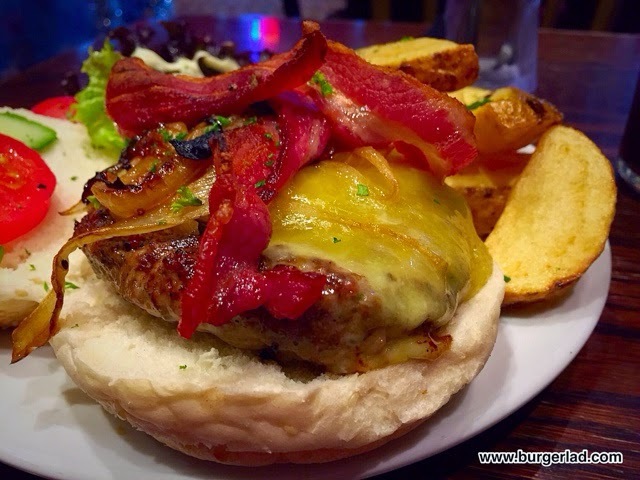 I would utterly love to get stuck into a few more of the fascinating sounding burgers on Lord Nelson’s menu. Would I recommend the burger? I don’t know. 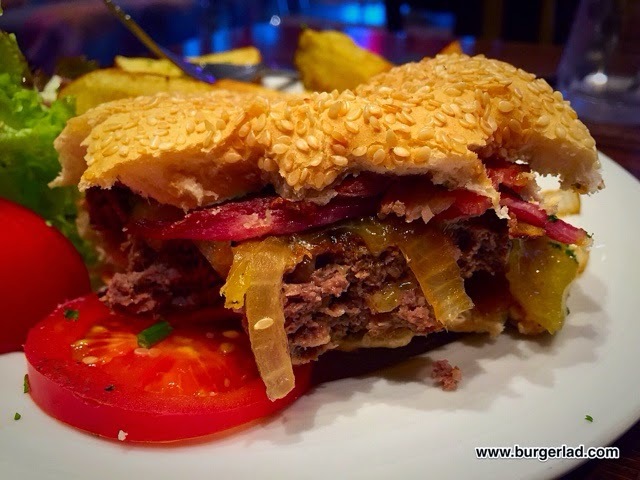 I think, if you like burgers, you need to give it a go. The generous serving and innovation here deserves attention and you’ll go a long way to find something quite so unique. I have no hesitation in recommending the venue though. As for me, I think it will be just the once. I’ll trade the one horsepower for my 453bhp, thanks. But as I said, I’ll be trying the rest of the menu at the next available opportunity. I work near the Nels, so I'm lucky enough to have tried pretty much every burger they have and I'd say the horse burger is probably the weakest of the lot. 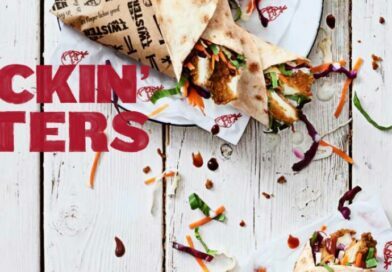 The Elvis, The Bluesy Lucy and the Hoff are my favourites., although they've just introduced a burger and ribs double which may well get to no.1 in my list. The portions are huge and so amazing value and their inhouse BBQ sauce is like nothing you've ever tasted. 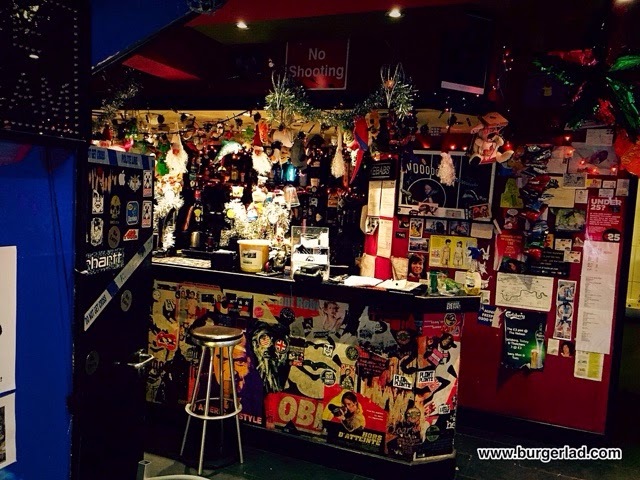 It's a very cool place with really friendly staff and the best burgers you'll find. Nasty, distasteful comments about Shergar. Not much unlike the burger itself by the sounds of it.